Red Pocket Mobile is an MVNO that uses every major carrier in the USA to provide service to its customers. That means subscribers can choose between AT&T, Sprint, T-Mobile and Verizon during the signup process. (Disclosure: I was not paid or asked to do this review. However, when applicable, affiliate links are used within the post). Red Pocket Mobile was founded in 2006 and the company prides itself on being American owned. Their phone plans have been designed to cater to those who have a need for international calling and for those who would like to save some money on their phone bill. All of Red Pocket Mobile's phone plans include international calling to over 70 countries. International calling minute allotments are equivalent to however many minutes the plan comes with. So a plan with unlimited minutes will have unlimited international calling. Similarly, a plan advertised as having 500 minutes will come with a combined 500 minutes that can be used either for domestic or international calls. All plans come with data that is hard capped except for on the $30 and $60 plans. Data is unlimited on those plans, although after their high speed allotments get used up, data speeds are throttled to a a minimum of 64 Kbps. On any plan, extra high speed data can be added to it priced at $10/GB. Red Pocket sells multi-month discount plans, however, they can only be purchased through Amazon and eBay. Priced annually at $255 which works out to an average cost of $21.25/month. Priced bi-annually at $153 or $25.50/month. Priced by the month at $29.75. Priced annually at $204 which works out to an average cost of $17/month. Priced bi-annually at $127.5 or $21.25/month. Priced by the month at $25.50. Periodically Red Pocket Mobile puts its eBay plans on sale. Additionally, eBay occasionally offers discounts through the use of coupon codes. Includes 100 minutes, 100 texts and 500 MB of LTE data to use each month priced annually at $60 which averages out to just $5/month. Includes 500 minutes, 500 texts and 500 MB of LTE data to use each month priced annually at $99 or $8.25/month. The same plan is available with service for 90 days priced at $29 or $9.67/month. Includes 1,000 minutes, unlimited texting and 1 GB of LTE data priced annually at $179 or $14.92/month. 1GB of data priced annually at $205 or $17.08/month. Priced at $69 or $23/month for 90 days of service. Pro plan with 4GB of data priced annually at $360 or $30/month. Also available for $109 or $37/month for 90 days of service. 90 days of service with unlimited talk, text and data with the first 5GB at LTE speeds for $90 or $30/month. 90 days of service with unlimited talk, text and data with the first 10GB at LTE speeds for $135 or $45/month. 365 days of service with unlimited talk, text and data with the first 5GB at LTE speeds for $240 or $20/month (also available on Sprint). I purchased a SIM card kit and plan from Amazon. I bought the monthly plan that included unlimited talk and text with 3GB of high speed data. I elected to subscribe to the plan on Verizon's network or what the company calls a CDMAV plan. I used an unlocked 64 GB Motorola G4 Plus for the review. My service was maintained for over 60 days and I refilled my plan twice. 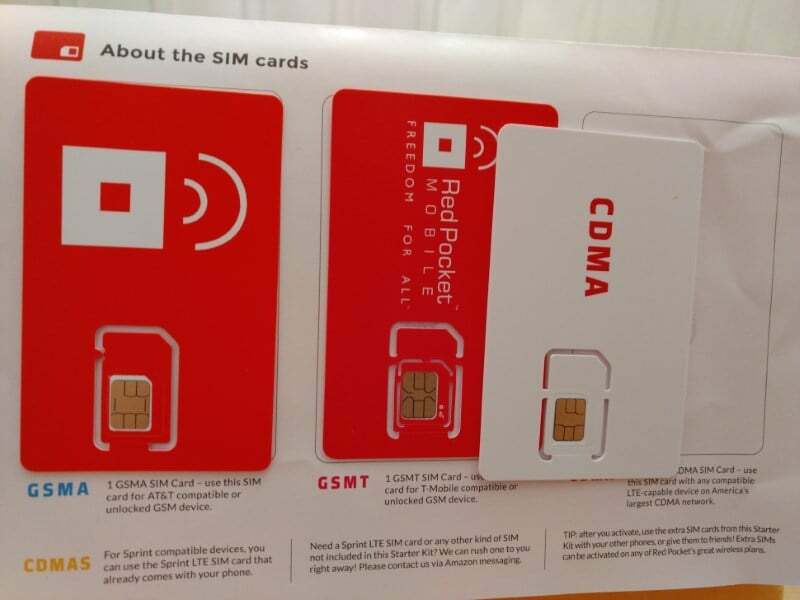 Red Pocket Mobile's SIM card kit supplied from Amazon was neatly packaged and came with detailed instructions on how to activate the plan on each of the 4 networks that it is compatible with. SIM cards for AT&T (GSMA), T-Mobile (GSMT) and Verizon (CDMAV) were supplied. To my surprise, there was no SIM card for Sprint (CDMAS). The instructions that came with the kit said that you could use the Sprint SIM that came with your phone. I surmise any Sprint SIM would do if you had one laying around. The instructions also said that if you don't have your own Sprint SIM, you could contact Red Pocket Mobile via Amazon messaging and they would rush ship you one. What the KIT did not contain was a pin number for the plan I purchased. The pin number actually came in a separate email from Amazon and Red Pocket. So if you do order this or any other plan from Amazon, keep this in mind. I actually over looked the email that was sent and wondered where my PIN number was in the kit. D'oh! Red Pocket's online account registration system seemed a little bit odd if not confusing to me. I was able to activate my service and port my number over before I even created an online account. On top of that, when you do create your account, you have manually add your phone number to the account. The whole process seemed a little less intuitive to me than perhaps it should have been. This was a different experience compared to what some of the other providers that I've tested offer. On the bright side, the number port in was blazing fast. It was done in just 5 minutes! It was the fastest port in that I have experienced to date. I'm sure Ultra Mobile, the provider I ported out from should also be credited for that speed. Although the number port in was fast, things were not without issue. I could not get the internet or MMS messaging to work. It was a classic APN issue, or so I had thought. Red Pocket's system told me to download an app to automatically configure my phone for service. I downloaded the app, but it did not work. In fact, the app told me it doesn't work because I don't have a Red Pocket SIM card? Next up I contacted customer support by chat about the issue (Saturday evening). I was convinced it was due to an APN issue and pleaded a little bit with them to tell me the APN. They insisted it had nothing to do with an APN. The representative tried for over 30 minutes to get it to work, but could not. Support said they would need to escalate the issue, but can only do so Monday thru Friday. I had ported on a Saturday. Before disconnecting from chat, the rep told me that since it was a new port, it could take a while for data to start working. At this point I did seem to have MMS messaging working but still could not connect to the internet. I then tried to place a phone call. Guess what happened? I heard a message stating that my account was not yet active! Good grief! The automated system told me to press the number 1 on my phone to activate my account. Once I did that, the call went through, and shortly thereafter I had working data! It seems that you can chalk some of the issue up to user error, and instructions that don't spell out clearly enough what to do to activate your account. I should also mention that Red Pocket's activation confirmation email went straight to my spam folder! Two days after activation, I began to have trouble with my service again. This time I could not place or receive any phone calls. So back to customer support chat I went. I initiated a chat at about 1 PM, and about 10 minutes later I was connected to someone. Customer support this time seemed to be pretty slow to respond to my questions compared to when I spoke to them over the weekend. Again, support was unable to resolve my issue and I was told it would need to be escalated. Support told me it would take 24h - 48h to fix the issue and that I should contact them again in two days to check on things if they weren't resolved by then. The total chat time including the initial connection waiting period took 25 minutes. By using that dialer code, I gained access to a hidden menu where I could see my "phone information" settings. Here I saw that my "voice service" was emergency calls only, the voice network type was set as "unknown" and my data network type as LTE. After playing around with things here, I discovered that if I set the radio band mode to Automatic, I got voice service. If I set it to United States, I had no service and the issues just described. I also had to set the preferred network type to "LTE/CDMA." 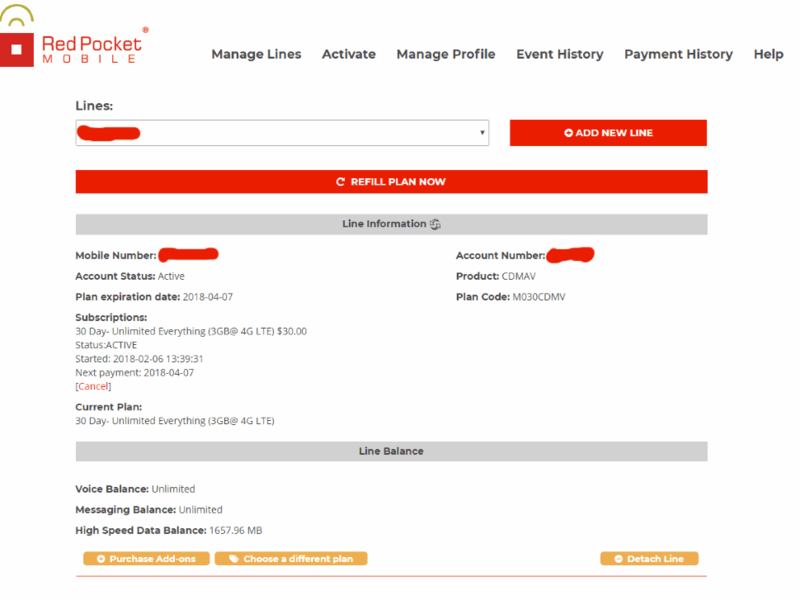 Red Pocket Mobile's account dashboard is nothing to write home about and unlike Ultra Mobile's, it won't get any style points. It's dashboard seems a bit dated but it does get the job done. That confusion is intentional, because my data speeds were certainly confusing, they were inconsistent and at times throttled. Traditionally Verizon MVNO's have had their download speeds capped off at a maximum of 5 Mbps and upload capped at 2 Mbps. I am happy to say that at least initially, my speed tests showed download and upload speeds to be uncapped. I had tested them every day for nearly a month and saw quite a bit of variation in the speeds, but they did remain uncapped. I will share the results of the speed test shortly, but first I want to discuss a few things that happened to me during my trial. Upon initiating a chat this time, it was estimated I would have a wait time of 2 minutes. However, 12 minutes later, I finally reached a representative. I explained what was going on to customer support. They told me to hold on for a minute and that they would reset things on their end. When they were done, they said I should soon have faster speeds and to just reboot my phone. I thanked them and left the chat. After rebooting my phone, I did find out I had faster speeds. And can you guess what those faster speeds were? 5 Mbps download and 2 Mbps upload!! That certainly wasn't what I was expecting. So back to customer support I went. They insisted they never had faster speeds and the network was restricted to 5 Mbps download and 2 Mbps upload. I of course had a lot of evidence to the contrary. I also had talked to them about VoLTE calling. Shortly after I first started service I had access to VoLTE. It seemed to come and go on a few occasions, but I'll get back to that later. Unfortunately I really couldn't get anywhere with them about faster speeds. I do believe I was told though that they would have to get back to me later about VoLTE through email. My notes on this are a little bit lacking though. I ended sending an email to a contact I have at the company asking them about my speed issue. The email went unanswered. Fortunately though, after several days passed, I had unthrottled data on the Verizon network once again. What a strange experience this all was. 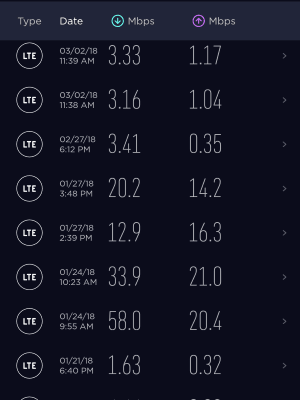 I have to assume the reason why I experienced all these different speeds during my trial, is that Red Pocket and or Verizon are testing out the impact of different speed tiers and unthrottled data on the end user. Verizon only started allowing unthrottled data on select Verizon MVNO's just months ago. Overall I consumed over 6GB of data during the review period. During the testing period, I ran 30 different internet speed tests at unthrottled LTE data speeds. The tests were run at different times of the day and different days of the week. Speeds were highly variable. When speeds were slower than expected, the results were confirmed by using a different server to run the speed test. In all I averaged download speeds of 16.29 Mbps and 9.72 Mbps upload. Download speeds ranged between a low of 1.63 Mbps and a high of 58.0 Mbps. Upload speeds came in as low as 0.22 Mbps with a high of 20.4 Mbps. Ping times varied a bit going no higher than 80 ms. The average ping time was 49 ms.
During the two different periods of time where my data was for some reason being throttled, I got speeds of 3.15 Mbps download and 1.08 Mbps upload during the slowest throttle period, and 5.27 Mbps download and 2.65 Mbps upload during the faster throttle period. Pings averaged 39 ms.
Red Pocket Mobile's CDMAV plans are not advertised as supporting mobile hotspot, but to my surprise it worked without issue. I connected my Le Eco Le Pro 3 to the Motorola G4 Plus's hotspot with ease. Data speeds came in just as fast as they did on the Motorola. YouTube streamed at 720p without issue. I played Texas Hold 'Em through WSOP without any problems. I was surprised that I never got any warnings about tethering. It should be noted that I only used tethering during the data periods where my speeds were unthrottled. It may not have worked during a throttling period. During the course of the review I logged 239 minutes worth of calls with 93 minutes incoming. I had no dropped calls and the signal was good everywhere I used the phone. I did however experience one oddity. During my first month of service I actually had VoLTE. Unfortunately, it would work for a week, then disappear, then come back again. I did reach out to Red Pocket after it disappeared for a month, and customer support didn't think it was even available. After a brief chat though, they did confirm to me that it is in fact available and enabled for my account. However, it never lit up again on my phone by the time I finished the review. This could be due to more testing being done between Verizon and Red Pocket, just like they appeared to be doing with data, or some other issue related to the ROM that I was using with my phone. Over 1,500 text messages were either sent or received during my trial period. I did not have any issues sending or receiving them, or issues with MMS. I did have a problem for a brief while with overly compressed MMS picture messages that came in at about 32 KB size no matter how big they were when they were sent to the line. The problem ended up not being caused by Red Pocket, but rather it was caused by the Android messaging app. When I switched to using the Verizon Messages app, the problem disappeared. My customer support experience has already been detailed throughout this review. Although the chat support representatives I spoke with didn't necessarily have an immediate answer to my questions, I did feel mostly satisfied with the experience. Getting in touch with someone was relatively quick and easy. Even if it took a little bit of time, they were able to eventually answer my questions. The only real disappointments to me is that they were unaware that their service was including unthrottled data and that the representative did not ask me if I formally activated my line by dialing any phone number which would have quickly resolved the non-working data and MMS issue I had when I first ported in. I did not contact customer support by phone. However, they actually contacted me once! I got a call from them to tell me that VoLTE was not active on my line, and they just got it as a new feature a few weeks back. I surmise I was contacted due to one of my online chats with support. I called their customer support number once just to check it out. Customer service is available in English, Spanish, Chinese and Filipino according to their website. Their support number is like many others in that you have to navigate through several menus before you get to a live person. 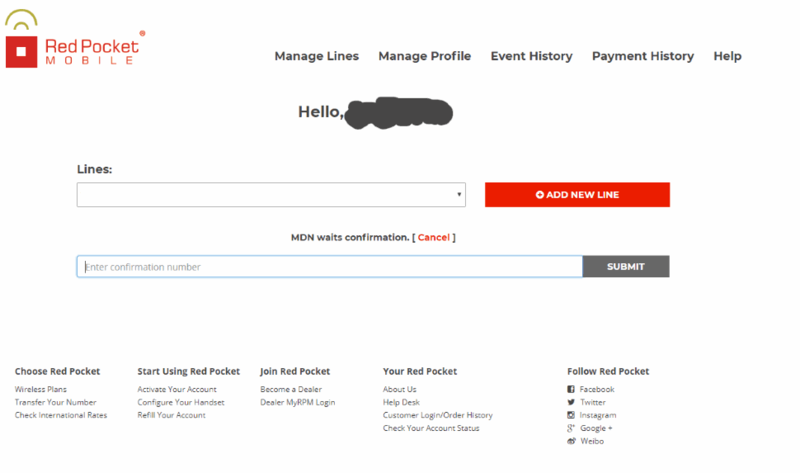 When you finally get to the point of being put in a waiting list for support, Red Pocket does tell you how many people are waiting in front of you and your estimated wait time. Those of you that like to jump straight to the ratings and recommendation section of a review, may be better served to read the whole review this time. I did have a few bumps in the road with my service, some at the beginning, and a few oddities throughout the whole trial with my data speeds. It is the data speeds that may be an issue for some. For my needs, whether data was unthrottled or throttled, I really didn't notice a big difference in my day to day activities. The biggest differences were really only noticed while doing speed tests. If you are really worried about data speeds on Red Pocket Mobile's CDMAV plans, aka Verizon's network, you may want to hold off until they finish doing whatever kind of testing that they are doing. I'll update this review if I receive word of the tests being completed. With that being said, for my needs I would not have any problem using the service as my main line. I do not know if your iPhone 7 will work with Red Pocket, Boom Mobile or Total Wireless. Where did you buy your iPhone 7 from outright? Did you buy it unlocked? You can check compatibility here https://bestmvno.com/phone-specs/ or even better, use Total Wireless’s IMEI checker to see if it will work with a Verizon MVNO. If you are not using that much data, and your phone is compatible with Verizon MVNO’s, you may also want to check out < ahref="https://fave.co/2P96FXW">US Mobile or Pix Wireless. Just note, US Mobile charges a $2 service fee on top of prices listed. I m very satisfied with Red pocket service on cdma network. I m with them since 9 months. I have ported another 2 numbers with them. When i ported my number to cdma 9 months back i had some problem connecting to verizon network and it took 1 day to resolve the issue. But when i ported another number to cdma 2 weeks back everything went fine and i had red pocket service within 5 minutes of porting. So they must have fixed the glitches. I would definitely recommend Red pocket. Do you have the correct and working APN settings for Verizon on RedPocket? Same issues, only works when I had them turn on VoLTE. If I turn it off on my phone, or by having them do it, I cannot make / receive calls. Please post the complete, correct and working APN settings. Thanks! As explained in the review above, I do not think the APN settings will fix your issue. Can we send mms android red pocket at&t? For some reason, I only received a micro sim card for gsmt but I got nano for at&t, what gives? My phone only supports nano, potential red flag but I don’t have a choice at this point. I’m going to try out gsma and hopefully it works out in my area. You are allowed to send group messages and photos by text. If you can’t do that you either have the wrong APN settings for your phone or you have service on the ATT network with an iPhone. Apple is believed to block group and picture messages from working on ATT based providers that either don’t pay Apple for the privilege or sell iPhones. You won’t lose your number even if the service for the month runs out. You would have to add money to your account though to reactivate the line and get the number going again. Did you try changing and resetting the APN?